The new car was launched to the team’s fans from the Silverstone garages via a live 360-degree broadcast on Facebook, YouTube and the Team’s official website. The Launch was held as part of the team’s official 100 km Filming Day. 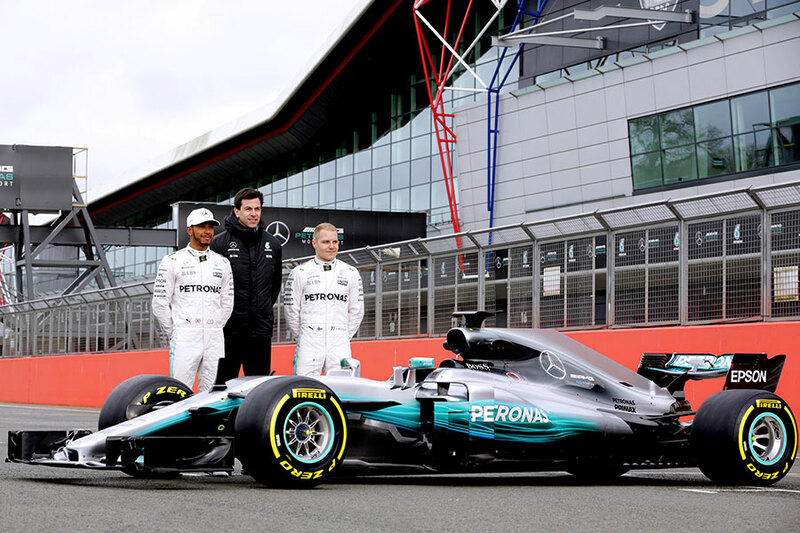 The F1 W08 EQ Power+ completed its first laps on Silverstone’s 2.96 km International Circuit, in the hands of both Lewis Hamilton and Valtteri Bottas. “But the dominant feeling in the team right now is one of excitement – the factory is buzzing with anticipation. It has been a really motivating challenge to develop a brand-new car concept and I have never seen our determination to succeed higher than it is right now. “Of course, we had a curve ball from Nico late last year that left us scrambling a little bit in the winter. But we found a great solution with Valtteri and I am sure that he will form a strong partnership with Lewis. They have both been working hard in the factory with the technical teams and, although we have a different dynamic to manage than in recent seasons, I don’t expect the competition between them to be less intense. And that’s how we like it. Today’s launch is not just the premiere of a new car – it also marks the global debut of a new technology label throughout the model range of Mercedes-AMG and Mercedes-Benz. From the forthcoming facelift of the S-Class, all future Mercedes-Benz Plug-In Hybrids will carry the designation “EQ Power”. 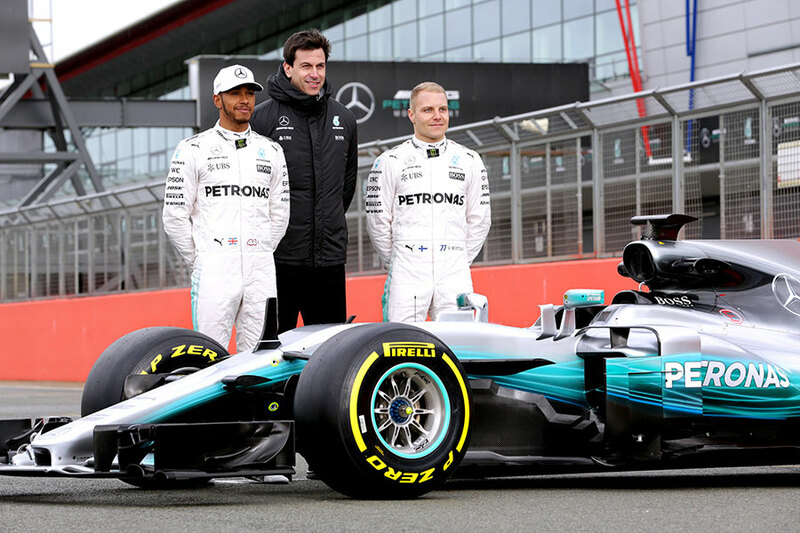 And the launch of the F1 W08 EQ Power+ makes the new F1 car the first Mercedes-AMG Hybrid to receive the “EQ Power+” designation, which will be used on all future Mercedes-AMG performance hybrids. The new model designation has been translated graphically into the livery of the new W08, with an electric blue visual representation of the airflow across the car running from the front wing to trailing edge of the sidepods. This distinctive signature derives from the electro-look of the Concept EQ unveiled last year. One of the most significant changes for the new season sees Valtteri Bottas become just the fourth Silver Arrows driver of the modern era in 2017. 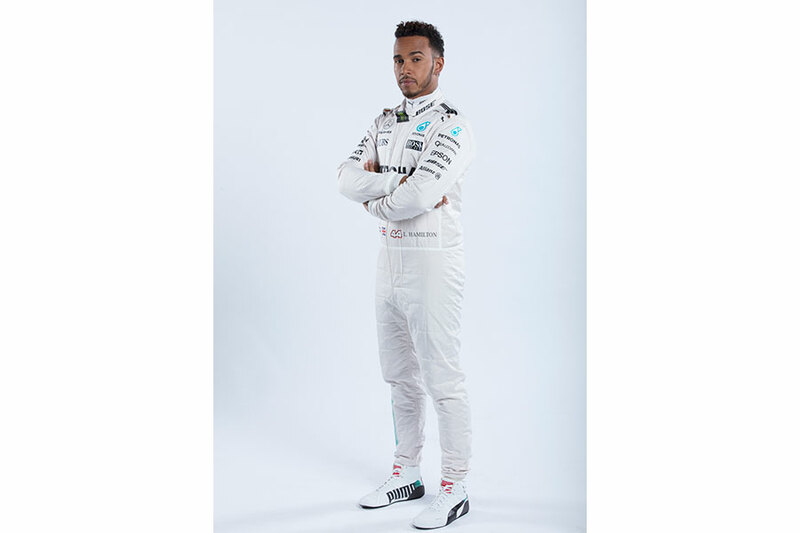 Next to him in the garage will be three-time world champion Lewis Hamilton, who comes to the new season refreshed and reinvigorated. “It’s been a fantastic winter and an exciting training season for me,” explained Lewis of his preparations for the increased physical demands of 2017. “I’ve added a new element to my training regime that has kept it really enjoyable and I’m in great shape. Then I’ve visited the factory and that has been super encouraging to see the way in which everybody is working. “After all the success we have had, people could be sitting back and resting on their achievements. So it’s inspiring to see how everybody is pushing even harder than ever and taking nothing for granted at all. “This is the most exciting period of the year when the car comes together – and my privilege as a driver is then to get to feel what it’s like and what all the team has worked for. “There’s not too much point setting goals until we’ve really driven the car, so I’m going to go with the flow until we understand the possibilities. “I’m the best equipped I have ever been to work with my team-mate and manage the relationship with my experience and maturity. “It’s a new chapter in my career, a new team, new regulations… new everything! “I’ve been waiting for a long time to get this car out on track and, although this is just a Filming Day, I’m looking forward to starting to test properly next week in Barcelona and to really understand the car that we’ve been given by everybody in Brixworth and Brackley. “It has been a busy winter for me since signing with Mercedes and we have tried to make the most of the time we have had. “We’ve been going day by day, making the most of each one, spending a lot of time in Brackley and going through as much stuff as possible with the engineers. “I feel well prepared in such a short time but, of course, the learning curve is still steep and I’m getting more useful information every day. It’s up to us to make the most out of the time together. “In terms of my physical preparation, I think I have done the most amount of training of any winter so far. I have done some good training camps and feel in the best shape I’ve ever been, definitely ready for the season ahead. If last year’s W07 was all about refinement and elaborate, detailed evolution, the W08 project has gone back to first principles. With the car having to be designed before running the definitive 2017 tyres, and in some parts before the regulations had even been finalized, it was important to arrive quickly at a sound base architecture, while following a flexible, adaptable philosophy to allow scope for major developments during the season. With this in mind, only 17% of the components in W08 have been carried over from its predecessor, with the team’s main focus lying on optimizing the car within the new aerodynamic regulations. This is also the first major regulation change to occur under the Aerodynamic Testing Regulations (ATR), which limit every team to the same maximum amount of wind tunnel testing – 65 runs per week. Given the extent of the regulation changes, the first W08 concept ran in the team’s 60% Brackley wind tunnel before the first race of last season and has completed over 2,000 runs during its development so far. In addition to the new shapes of front and rear wing, the biggest areas of aerodynamic opportunity are the floor and the barge board area in front of the sidepods, which have been the focus of significant work. And while the performance opportunity has been significant, the design teams have also worked to improve the W08 structurally in order to withstand the substantial increases in aerodynamic and mechanical loads. The Power Unit, christened M08, has also been comprehensively redesigned for the new season. Although the previous token system did not constrain power unit development since 2014, its abolition allows the technical group more freedom for engineering solutions. As ever, much focus has been on the primary energy conversion opportunity – the combustion process – but there are also many opportunities for gains further downstream, including within the engine ancillaries. The new aerodynamic regulations have had a significant impact on the configuration of the engine which, as a structural component of the car, must cope with significantly greater physical loads. To maintain its structural properties, the engine is therefore slightly heavier than its predecessor. In addition to this comes an increased duty cycle, with the cars expected to spend approximately 10% more of every lap at full throttle – a change that is reflected in a 5% increase in race fuel allowance for the new season. M08 has also been designed for increased durability, with only four Power Units per driver per season permitted by regulation in 2017. 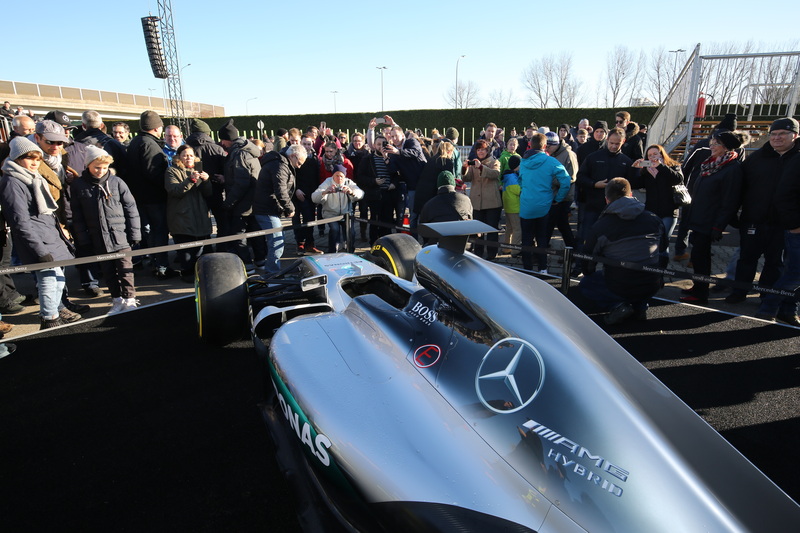 The W08 EQ Power+ will begin its testing program in Barcelona on Monday 27 February. In order to maximize potential mileage across the fortnight of testing, the drivers will complete half-day sessions in the car as per the team’s practice in 2016. 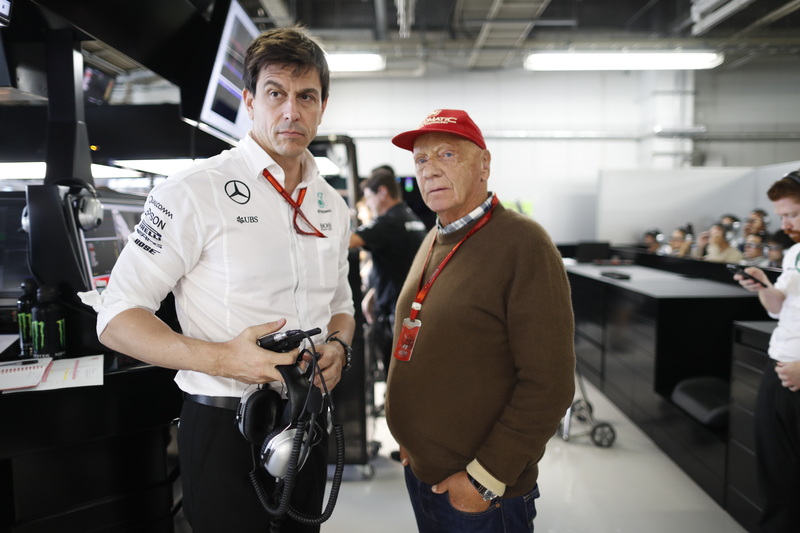 Mercedes-AMG Petronas Motorsport has announced that Toto Wolff and Niki Lauda have signed new contracts which will keep them with the World Champion team until the end of 2020. This date aligns with the expiration of the current Commercial Agreement with Formula One Management. Niki Lauda began working with Mercedes in late 2012. Since 2013, he has held the role of Non- Executive Chairman of the board of Mercedes-Benz Grand Prix Ltd and holds a 10% stake in the Team. Toto Wolff joined Mercedes from Williams in February 2013. As a 30% shareholder in Mercedes-Benz Grand Prix Ltd and an Executive Director, he has worked since that time as the Team’s managing partner, responsible for day-to-day operations alongside his wider responsibilities as Head of Mercedes-Benz Motorsport. The shareholding arrangements remain unchanged, with Daimler AG retaining a 60% majority stake in the Team. Mercedes-AMG Petronas Motorsport has also announced that James Allison will join the team from 1 March 2017. James is a highly-distinguished Formula 1 engineer who has won world championships with both Ferrari and Renault, in addition to holding senior leadership roles in both teams. He will join Mercedes in the newly created role of Technical Director and will lead the Technical organization. He will be welcomed warmly by the established group of senior technical managers that delivered the last three Formula One double world championships. James Allison will report directly to Toto Wolff, who will have overall responsibility for running the team.